No. 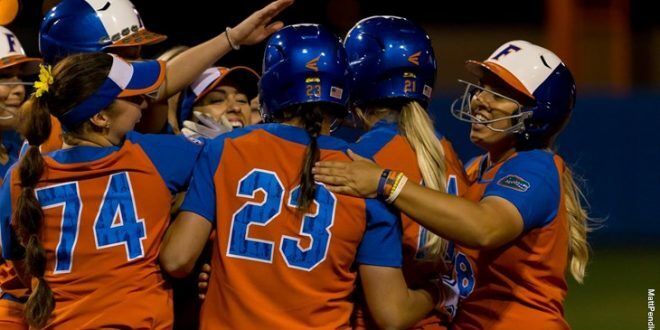 2 Florida Softball is back in action this weekend with a three-game series against SEC Rival Georgia. After sweeping no. 24 Kentucky last weekend, the Gators prepare to face a tough Georgia team. This is the second weekend of conference play for the Gators. The Bulldogs come into this weekend series against the Gators on a 23-game win streak. They currently have 24-1 overall record and are 3-0 in the SEC. On Wednesday, Georgia faced Bucknell in a double-header. They outscored Bucknell 12-2 in 13 innings. Short game: the Bulldogs know how to bunt and slap for hits. That is something the Gators haven’t yet faced this season, so could be hard for them to field. Their Pitchers: Georgia is solid in the circle with two upperclassman pitching. Junior Kylie Bass and Senior Brittany Gray help the pitching staff hold down an ERA of 0.70 through their 25 games and 161 innings. They’ve also recorded 210 strikeouts, 16 earned runs, and 16 shutouts. Stealing Bases: The Bulldogs rank 16th in the nation for stolen bases. Plus, they have the nation’s leader in stolen bases, Senior Cortni Emanuel. Home runs: While they might produce on the small ball, they also have a total of 37 home runs this season. Florida has faced a multitude of opponents so far this season. Last weekend, they were able to sweep the Kentucky Wildcats and outscore them 13-2. That is the 14th time the Gators have taken an SEC series. The last time they dropped a series was against Alabama back in 2016. Junior pitcher Kelly Barnhill: Barnhill dominates the circle for the Gators. Last weekend against Kentucky, she recorded two shutouts; one of those being her fifth-career complete game no-hitter. She limited the Kentucky offense to a .091 batting average. Junior Amanda Lorenz: Lorenz not only delivers for the Gators offensively but also shows up in her left field position. Last weekend, she robbed the Wildcats of a home run on Sunday after catching the ball over the left field wall. She has reached base safely in 23 games now after that weekend. Senior Kayli Kvistad: During the Saturday game against Kentucky, Kvistad hit the game-winning single to get the Gators the win. On Sunday she didn’t play due to flu-like symptoms, but Head Coach Tim Walton says she should be ready to play this weekend. Also this week, Kvistad was selected as a candidate for the Senior CLASS, Celebrating Loyalty and Achievement for Staying in School, Award. Florida currently leads Georgia in the overall series record 38-25. 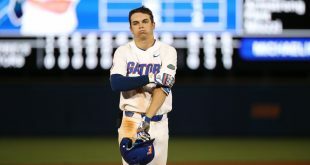 Last season the Gators swept the Bulldogs in Gainesville. You can watch or listen to this weekend’s game on the SEC Network +, WatchESPN.com, and WGGG (92.1 FM/1230 AM) & WMOP (100.1 FM/900 AM). Friday, March 16: First Pitch at 6 p.m.
Saturday, March 17 & Sunday, March 18: First Pitch at 2 p.m.